These no bake cookie dough truffles are made with oat flour, dipped in dark chocolate, and decorated with a milk chocolate drizzle. They are the perfect way to get your fill of edible, chocolate chip cookie dough! Valentine’s Day is just one week away, so I thought I’d share the recipe I made my husband Ben for our first ever Valentine’s Day together. Whether you’re looking for something chocolatey to give to someone you love, or whether you just want to spoil yourself this year, these chocolate chip cookie dough truffles make the perfect Valentine’s Day treat! Ben and I started dating just a couple months before Valentine’s Day, so I wanted to give him a simple and not cheesy gift. I ultimately decided to make these truffles because one thing I’d learned about him was how much he loves cookie dough. I found a big jar, filled it with these cookie dough truffles, and tied a pretty ribbon around it. To this day, it’s still one of his favorite gifts he’s ever received from me. What can I say, he’s easy to please! In order to make no bake cookie dough safe to eat, all you need to do is omit the eggs and swap out regular flour for finely ground oat flour. Which means, as long as you use certified gluten free oats, this recipe can easily be gluten free (double check the labels of your other ingredients as well if you’re making these for someone with a gluten intolerance). Ben and I aren’t gluten free, but I always use oat flour (rather than wheat flour) when making edible cookie dough. If you’re interested, I wrote more about why in the post for my cookie dough brownie cake recipe! Even with a few slight changes, these cookie dough truffles are absolutely everything you love about your classic chocolate chip cookie dough, just without the potentially harmful raw eggs and uncooked wheat flour. I call that a win-win! Chill the cookie dough balls before dipping them so they keep their shape and don’t start fall apart in the warm chocolate. Use a vessel that is deeper than it is wide to hold the chocolate – I like to use an oversize mug. This makes it easier to dip and completely cover the truffle. However, you still want a wide enough opening so that you can get in there with a fork to pull the truffle out. Dipping method: drop the truffle into the chocolate, then pour a spoonful of chocolate on top to completely coat it. This keeps things neater than having to roll the truffle around. Scoop the truffle out of the chocolate using a fork. Let the excess chocolate drip off the fork while gently, but firmly using two fingers to tap the wrist of the hand holding the fork (i.e. don’t tap the fork itself). Use a toothpick to gently slide the truffle off the fork and onto a wax paper lined cookie sheet. Use a squeeze bottle for maximum control while drizzling the chocolate on top of each truffle. And that’s it! No actual baking involved with this recipe, and these truffles can be ready in just a couple hours (that includes chilling time!). So, the only thing left to decide is… will you be making these cookie dough truffles to treat yourself? Or to give to someone you love this Valentine’s Day?? Either way, don’t forget to snap a photo and tag @flourcoveredapron on Instagram so I can share the love! 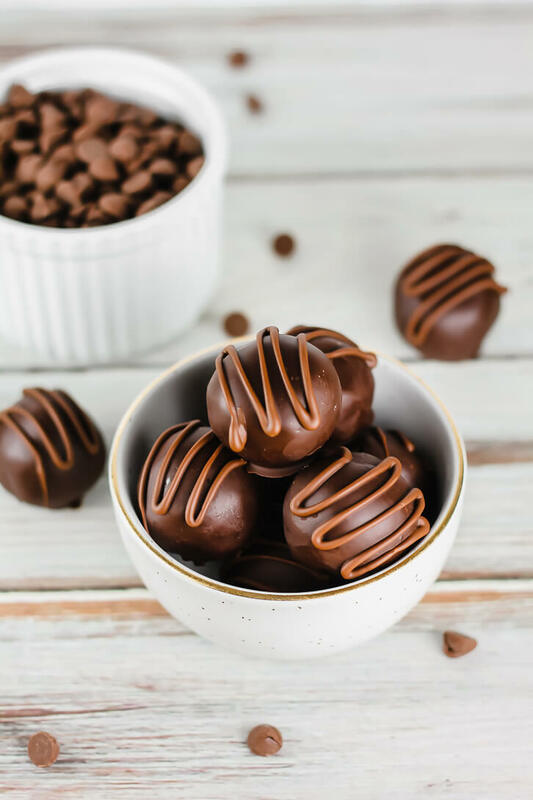 These no bake and gluten free chocolate chip cookie dough truffles are made with oat flour, dipped in dark chocolate, and decorated with a milk chocolate drizzle. They are the perfect way to get your fill of edible, chocolate chip cookie dough! Using an electric mixer, cream together the butter and both sugars on medium-high speed until light and fluffy. Add vanilla, salt, and oat flour and mix on low speed until combined. Add milk and mix again until combined. Fold in the chocolate chips with a spatula or wooden spoon. Cover a baking sheet with wax paper. Using a medium-size cookie scoop (about a tablespoon and a half), scoop out and roll the dough into balls. Place on the prepared baking sheet, then freeze for 30 minutes or refrigerate for a couple hours. Once the cookie dough balls are chilled, melt dark chocolate according to package directions. Coat truffles one by one in the dipping chocolate: Drop truffle in chocolate, spoon chocolate over top to coat. Use a fork to scoop out truffle and let excess chocolate drip off (gently, but firmly use two fingers to tap the wrist of the hand holding the fork to help the chocolate drip off). Use a toothpick to help slide the truffle off the fork and onto a baking sheet covered with wax paper. Once dark chocolate has hardened, melt the milk chocolate according to package directions and pour into a squeeze bottle. Drizzle milk chocolate over each truffle. Let harden completely. Store in an airtight container in the refrigerator. *Oats are technically gluten free, but can often be processed in facilities that result in cross-contamination with wheat. Make sure to get certified gluten free oats if needed. I make my own oat flour by grinding my oats very finely in a food processor (when you think you're done, grind a little more), then sifting the oat flour a few times in a flour sifter. Discard any larger pieces after sifting. This helps ensure a finer texture. These look so good! It would be hard not to eat them all myself! Haha, I know! It’s a struggle for sure.